Goals are great….dreams are great…..intentions are great. But what really matters is: “Are you are executing?” Are you doing what you want, how you want, to get the results you want? Too many times in life we are affected by pressure. It may be external pressure, such as pressure from a boss, a client, or a deadline. Or it may be internal pressure that we put on ourselves. To be GREAT you have have to perform at a high level under all circumstances, and that includes under pressure. Most anyone can get results when things are going well. When there is no pressure, we think clearer, we breath easier, and we feel more relaxed and confident. But those who go down in history as greats, think just as clear, breath just as easy, and are just as confident when the pressure is on. When things are not looking so good, or the deck is stacked against you, and your back is against the wall….this is when you must perform. You must execute! 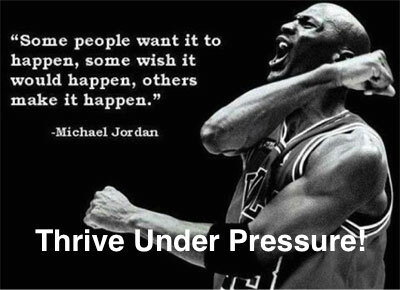 The GREAT ONES learn to thrive under pressure. Don’t back down when the pressure comes! Don’t secretly wish it would go away. Embrace it and welcome it. It’s only when you perform under pressure that you really go to the next level. Let’s face it, life is full of pressure. It’s coming at you from all sides. Sometimes you feel like you can’t take any more pressure, and you think you are going to explode. You are always able to handle more than you think you can. Don’t sell yourself short. You can handle the pressure, and that is what will bring out the greatness from inside you. Every tough experience you go through is preparing you for the next one. Click To Tweet When you get through one, just remember another one is just around the corner. That’s the way life is. Each time you get through that tough experience…each time you handle the pressure, you are stronger, more capable, and more confident than you were before. So welcome the pressure! Allow the pressure to refocus you and to bring out your best. When the pressure is on, it’s your time to shine!